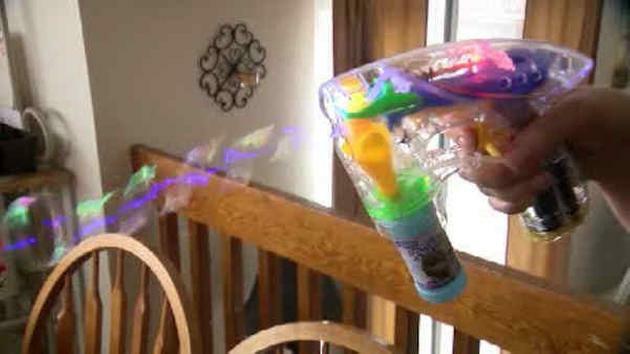 You know those clear plastic toy bubble “guns” that do not in any way whatsoever resemble a real gun and can only “shoot” someone with harmless bubbles? Well, now a five-year-old in Colorado has been suspended for bringing one to school because the school considers it to be a “fake weapon”. A policy that doesn’t include the actual definition of weapon, being “a thing designed or used for inflicting bodily harm or physical damage” which is not something a bubble gun can really do unless they are trying really really hard? The policy includes fake firearms that could reasonably be mistaken for an actual firearm, but many question if that actually applies to the princess bubble gun. The operative phrase being “fake firearms that could be reasonably mistaken for an actual firearm,” which is the opposite of the princess bubble gun which can only unreasonably be mistaken for an actual firearm by people without functioning common sense. While the girl’s mother says there needs to be some common sense, and there does, what she doesn’t understand is that common sense long ago went extinct in America’s public schools. There’s hardly any left. No one’s really sure if it still exists there or not. It’s like a rare endangered bird that one must stake out to find and have a camera ready to take a picture of it if you do so you can prove you actually really saw it and aren’t just making stuff up. We have schools that are suspending kids for Nerf guns, Lego guns, bubble guns, putting a picture of gun wallpaper on their computer, for “finger guns” on the playground, and even for biting a breakfast pastry into an “L” shape so that it kinda sorta resembles a gun (even though it is just a Pop Tart and for crying out loud, what violent damage is a little kid going to do with a freaking Pop Tart?). Next thing you know, the “news” will be inundated with stories of schools going on paranoia lockdown because a kid got caught thinking about a gun. These incidents have nothing to do with student safety and everything to do with traumatizing children into never exercising their Second Amendment rights. It’s about engineering a nation of obedient and totally defenseless sheep. For more of this brainless stupidity, see below. SHHHH! DON’T EVEN TALK ABOUT GUNS AT SCHOOL! Contributed by Melissa Dykes of The Daily Sheeple. Melissa Dykes is a writer, researcher, and analyst for The Daily Sheeple and a co-creator of Truthstream Media with Aaron Dykes, a site that offers teleprompter-free, unscripted analysis of The Matrix we find ourselves living in. Melissa also co-founded Nutritional Anarchy with Daisy Luther of The Organic Prepper, a site focused on resistance through food self-sufficiency. Wake the flock up!